Congratulations to the Good Diabetes Care in School Award holders in the North East & Yorkshire, Diabetes UK officially recognises that these schools deliver effective diabetes care and management. View the winning schools in the North West & Yorkshire below, and to view the national winners visit ourhonour wall. They've done everything from my daughter's care plan and thought about her all the way." The day to day care at this school is excellent. Type 1 diabetes requires constant monitoring and the school support my child with this in a postitive and supportive way. They go out of a normal supportive role to ensure my child is able to maintain her health and her educational needs." My daughter was diagnosed with Type 1 diabetes about 18 months ago when she was 8. it was a huge shock and we as parents struggled as to how she would cope with it, especially in school. But with outstanding support she's had within the school this has been much easier than expected. Also, the communcation between school and myself is second to none." The support my daughter gets in school is second to none. On a daily basis she recieves one-to-one care. Staff are keen and always willing to attend any session I give, gaining information regarding the child's diabetes. They share information and handover to staff when the child moves up classes. We have always been allowed to take my daughter for her regular hospital appointments without any problems. All staff have taken an interest in my daughter's care from teachers to the school cook, including her classmates. I personally couldn't ask for a better school. I know I can take him to school, that he will get looked after and will be in safe hands. The children have been encouraged to manage their diabetes within a supportive environment, yet promoting their need for independence. Staff ensure that the children are included in all school and extracurricular activities. If there were any problems, I was always informed by the school, i.e hypos and medication replacement. Medical assistance was 100% always. The school has Invididual Care Plans for all children with Type 1 diabetes . Everything to do with my daughter's day to day care , every decision is talked through with her best interests at heart. We have an excellent relationship with school and an even better communication and understanding in school and for after school activities. The school acknowledge the child's other medical conditions as well as diabetes. The school works closely with the student's parents and diabetes team, to ensure staff are well educated and trained for the child's needs. Their proactive approach ensure the child's safety and wellbeing at school. The whole school have dealt with my son's diabetes extremely well. Children in the class are all aware of his condition. Catering staff know the importance of carb counting and teachers are great at recognising when my son isn't himself and take readings. The child is included in every activity and supported well during hypo glycaemia. The school have always been keen to help in any way they can. They have offered assitance and guidance when dealing with the local authority and have very good contact with both us as parents and the local diabetes support team. The school has excellent communication with the child, who has Type 1 Diabetes and her parents. This has allowed the child to feel confident to manage her diabetes in school. My son is only recently diagnoses and having a member of staff trained and present in his classroom is a godsend to us as parents. It has also meant that any communication between the school and us has been easy. The school have very personalised plans of care for each student with diabetes. Several members of staff have a keen interest in helping students: very friendly and approachable. The school staff that take care of my son are amazing. They treat him any differently but are always there for him. Their communication with is great, I can't praise them enough. The provide fantastic support for the two pupils with diabetes, ensuring several staff are trained and regularly updated with review of care plans. They have also developed an extensive information board in the school. The school have learnt so much about diabetes since my child's diagnosis. They have understood that all teachers have become involved in learning the techniques with pens and his pump since he moved onto it. They know the signs of hypos and hypers and have not penalised him for sick days. The school has worked hard with parents, the child and myself to ensure that all the child's needs are met, supporting him as his confidence and treatment changed. 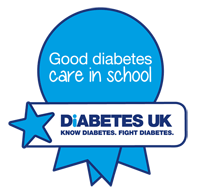 The school fully support the children and keep in touch with the diabetes team about any problems which may arise. They are both supportive and inclusive; within the diabetes team we feel this school exceeds expectations. From day one the school have supported my son 100%. They trained teachers and support staff as quickly as possible. The most important thing for myself as a parent, is that my son feels comfortable and treated as normal as possible; this has always been achieved with Emmaus. The school always endeavour to meet the student's and his family's needs in every aspect to his diabetes. Prior to recent trips abroad with school, staff and resident school nurse underwent in-depth training to help manage his diabetes on an activity holiday, involving the student throughout. When my son was first diagnosed, I didn’t want to let him out of my sight. The member of staff in charge of my son's care put my mind at ease and the school has gone above and beyond helping. They have had diabetes awareness raising assemblies too. The school are very supportive of meeting the child's needs. They encourage the child to test and fully supervise administration of insulin. Participation in all activities is encouraged. My child receives excellent care in school and all staff involved with him are well trained in caring for him. I appreciate everything the school does to ensure my child accesses his learning and that he is safe in school. This school has two young children in different classes (same school year) and the school treats the children as individuals. When something similar is occuring eg; introducing carbohydrate counting into school then the school has sensibly had training as a group but when the child has had indicvual needs they have treated them seperately. Day-to-day care is looked after well. Parents are always kept informed if there is anything staff need advise. We feel at ease when our children are at school and we know they're being taken care of. Our daughter's school is very supportive with her T1D. Her day to day care is outstanding. They cater for her needs brilliantly. I am very confident to leave her with members of staff. This school is engaged in staff education. They have invited and welcomed the diabetes nurse into school a number of occasions. The school supports this child with diabetes very well on a day to day basis. This school has done everyone in their power to accommodate ours and our daughter's needs. The support is second to none. Ongoing support for the student is always taken seriously. They go the extra mile to plan training and ensure all staff are trained. She loves her school and her staff. We believe that supporting this nomination will encourage other schools to be proactive. The school has allowed the child to fulfill a normal school life and be included not excluded from activities and trips. The care provided by this school has been amazing. The quality of the individual healthcare plan is amazing. I always felt he was in safe hands at school. Very supportive to both me and my son. Although there is a lot of emphasis on a child caring for themselves when at secondary school, she has been supported. I know my daughter receives excellent day-to-day care. We feel she is respected, listened to and cared for. Staff are always encouraging and supportive of young people with diabetes. Staff recognise the need to ensure they have the knowledge to assist their pupils. They treat him as an individual and don't let the fact that he has diabetes affect any extra school activities he wanted to take part in. The school has experience of caring for other children with diabetes and always treat each child as having individual needs. The school has been amazing. They have taken training on how to manage and identify symptoms of diabetes, in their own time. They have taken on board my suggestions and concerns and implemented them. The school has been supportive in looking after the children as individuals, listening to parents and working with them and the healthcare team. Parents feel happy to leave their children in school care. I am well happy with the overall support of the teachers with my childs' diabetes. The school has proved to be extremely proactive in ensuring the children with diabetes are included in all activities including residential holidays, spoting activities and just everyday school life. My son starting school gave me so much anxiety. However, from day one they were accepting of his extra health care needs and their ability to give the level of care and support he would need. The school have been accommodating to his needs. The school appreciate he is an individual and that his diabetes is different to others in the school. The staff are keen to learn more about diabetes. The school is fantastic. Everything they do for my son is amazing. I can't explain how grateful I am to the school. School staff have involved the student and his family in the care planning process from the very beginning and keep them informed at all times. They put my son's needs first. He feels totally confident that he can go to First Aid whenever he needs. They care and support four young people with diabetes. Staff are always enthusiastic around training requirements and attend updates. The overall level of care that my son received is exceptional. He is never treated differently. The care is a two way partnership; they always listen. They ensure individual healthcare needs are met by staff. They support staff and ensure they have the correct training. They liaise with the diabetes team and parents when necessary. My son is really satisfied for not being alone when he has his blood glucose check up and carb counting in lunch time. The best thing the school has done is make me feel at ease. They have gone above and beyond to care for Erin and keep me informed daily. She is always included and her teachers are eager to learn. The school listens to any concerns the parents have and are willing to accept extra training. They make sure several members of staff are trained to be experts in diabetes management at school. They go above and beyond their roles to give my daughter the care she needs. Their support is invaluable to us as a family. She feels completely at ease with them. They work collaboratively with the diabetes team and enabled regular support without disrupting education. They have been hugely proactive with my son's diabetes care. They have trained numerous members of staff and have shown great confidence. They have never treated him differently to other children. School staff have totally taken on board the management of the children's diabetes. Good relationships with parents and the diabetes team. Absolutely care for her but always discuss her independence and promoting that too. Never a question of non-inclusion. They allow the child to self manage with support. They include the child in all aspects of curriculum. They keep in contact with the diabetes team requiring training.